Put the hot chocolate on and get the stockings hung so you can start playing an old classic revisited for the Christmas season, in Fruit Shop Christmas Edition from NetEnt! Put the hot chocolate on and get the stockings hung so you can start playing an old classic revisited for the Christmas season, in Fruit Shop Christmas Edition from NetEnt! This fun and colorful slot has 5-reels and 15-paylines so you get in on the festive action and pull in some Christmas cash with just a few spins! Features include free spins, wilds and multipliers just like the original fruit shop game from the nordic game developer. In the snow covered slot setting, you’ll see the slot reels under a red and white striped awning. Just in front of the reels and behind is everything winter and Christmas like party streamers, a snowman, a Christmas tree, gifts and more under the starry night sky. Even the spin button is wrapped in a candy cane style. 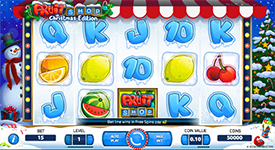 On the reels you’ll find some similar symbols to the original Fruit Shop slot but with a festive flair, including the Fruit Shop Logo, cherries, plums, lemons, oranges, watermelons, as well as card symbols ten through ace. Free Spins – The Cherry symbol is the free spins trigger in this game and you only need two or more in this game to win free spins. Hitting 2, 3, 4 or 5 cherries will win you 1x, 1x, 2x, or 5x free spins. Free spins are also re-triggerable and are really pretty generous! Wild – The Fruit Shop symbol is the Wild symbol and substitutes for all symbols in the game. Bet line wins with the Wild symbol also pay a 2x multiplier. Multipliers – As mentioned above, there are many multipliers that can be won in this game. During free spins, all wins pay a 2x multiplier so you’ll win double the amount that you would in normal play!